Our June challenge featured a balance of yang (active flow sequences) with yin (longer held postures). The yoga poses and sequences most familiar to you are likely YANG: active, muscle-building, energizing. June, as the bridge between spring and summer, was the perfect time to introduce a balance into our practices--to slow down and incorporating some calming YIN, longer held poses which increase your range of motion and focus on the connective tissue. Just below is our official challenge image featuring all 14 days of yin-yang. AND, just below that is a click-through slideshow of all 14 sequences and poses with written instructions. Even more exciting: right click on each slideshow image, select "open link in new tab," and ta-da, you've the 15 second Instagram video--now on YouTube--associated with each sequence. A visual and a written guide?! Time for some yoga! Day 1 of #RunnersLoveYogaYINYANG kicks off with some yang and a yoga movement commonly known as "cat-cow" since it moves between these two postures, otherwise known as #marjaryasana and #bitilasana! 2. INHALE as you send gaze up and tailbone up to arch your back and come into "cow": pause and breathe here. You are opening up the front body--think of pulling your chest forward through your arms. Imagine that you are pulling (the grip of) your palms backwards towards your knees to send the chest more forward. This last point is subtle but very effective. 3. Now EXHALE and send your gaze towards your belly button to round your back the opposite direction. Especially think of pressing the BASE of each palm into the mat to send the back higher. 4. Repeat steps 1-3 for a few more rounds of cat-cow. Then on your next cow, KEEP that curve of your spine and EXHALE to lower your chest towards the mat. On your next inhale, press back up to round the other direction, towards cat, but instead sink your bum towards your heels to come TOWARDS (not quite into) child's pose. Here use the grip of the palms on the mat to lengthen your torso. Repeat this cycle of: (inhale) cow, (exhale) keep cow curve and lower, (inhale) round back towards child's pose, (exhale) round back up to begin cycle again. Day 2 of #RunnersLoveYogaYINYANG is a flow which includes a movement from #gatepose/#parighasana to what I like to call "baby half moon"--this bind is a great prep pose for the bind in ardha chandrasana / half moon. 3. Now send your arm out to the side as you send leg out to the opposite side. Keep reaching. Release extended leg foot to the floor--use this stability point to transition towards a kneeling plane. Slide your closer hand down this side extended leg; send your other arm up and over to come into gate pose. Pause here. 5. Continue to flow from one side to the other, from gate pose to the opposite side. After a few rounds, see if it works to grab the back foot on the opposite side for "baby half moon." Here kick the foot into your hands. Once done, come back to hands and knees and repeat on second side! Day 3 of #RunnersLoveYogaYINYANG is our first pose which is more on the yin than yang side: #parsvabalasana, more commonly known as #threadtheneedle. I could stay here all day! 1. Notice we're on hands and knees again, so warm up with Days 1 (cat-cow) and 2 (gate pose--baby half moon). Then, from hands and knees..
2. Inhale and reach one arm all the way out to the side. Then exhale as you bring this extended hand, now palm up, all the way back under your body to "thread" it under your other arm. (This is where parva balasana gets its nickname of "thread the needle.") Meanwhile, start to wiggle the hand of your stabilizing arm towards the front of your mat. 3. Resist the urge to just plunk your ear down on the mat as you bring your arm across! Pause just before this, with shoulders parallel to the floor, to get that good outer shoulder stretch too. After a breath or two here, then just relax down to the mat and rest! 4. Stay here as long as you like. Maybe close your eyes! Option: take the hand from the front of your mat and wrap it around your back, grabbing the inside edge of your far thigh. Once done here, repeat on your second side. Day 4 of #RunnersLoveYogaYINYANG is #vasisthasana/#sideplank incorporated into your vinyasa. Keep in mind that this pose has a TON of options so do whichever are working for you *today*! Some possibilities: legs stacked on top of one another OR rest bottom shin on ground for extra support. If legs are stacked, some other options: a.) move top leg up and down a few times, b.) bring top leg into half lotus, c.) grab big toe of top leg with first two fingers of hand (connect with thumb) and then extend leg. 1. From downdog, inhale to shift forward to regular plank. 2. Exhale and lower through your plank. 🔹Before you touch the ground with your chest, inhale to scoot your chest forward to come into updog. (Remember to press strongly into tops of feet here, which are connected to the ground. Toenail side of feet is down.) 🔹Exhale to roll back over your toes and send hips up and back to downdog. (If uncomfortable to roll over toes, just flip over to normal downdog position one foot at a time.) Pause and breathe in downdog. 3. Inhale to again shift forward into plank. This time, rather than continuing to the sequence of step two, shift weight into your right palm and stack feet on top of one another to come into side plank. Take any options you want here. 5. Repeat entire sequence on left side! Repeat rounds as you like! Remember you can mix your side plank up each round too--try lifting your top leg, give the three-limbed plank a try! Day 6 of #RunnersLoveYogaYINYANG is back to yin with seated #ekapadarajakapotasana/#pigeonpose. Build from Days 4 and 5 to here! Notice you are staying upright (rather than walking hands forward to rest forehead on mat). The upright pose is actually a slight backbend, & stretches a different spot in your hips than the reclined version. Take your time at all steps here--for video purposes, I move fairly quickly through the prep, but stay for a minute or so at the various low lunge positions. Give your hips time to relax for the final pose. 1. From updog, tuck the toes under of your right foot to bring weight into this leg. Exhale; send your left foot high to the sky. 2. Inhale to mindfully bring your left knee outside your left foot; plant this foot outside your hand.🔹Release right foot toes to your mat. 🔹 Pause, breathe here. Gently press your left arm into leg, leg into arm. 3. Stay at palms OR (only if this is working for you--do NOT worry if it is not) drop to forearms. Again pause and breathe here. ⭐️ Another slightly less intense modification: drop your left forearm onto a yoga block or cushion. 4. Move your left palm/forearm/block out of the way and "heel-toe" your front foot across the front of your mat. The more parallel your shin is to the front of the mat, the deeper the stretch. Adjust this to your body's needs today--you can angle your knee more forward to make a triangle shape with your leg instead of keeping the shin parallel. Keep front foot a little flexed. 5. I find it extremely helpful to tuck my back toes under to stretch my back leg out farther. This helps keep my hips more square to the mat. (In particular, this may help if one side is tighter.) Release top of foot back to mat once in position. Send right hip forward and left hip back, as though lining up hips with a magnet. Press front of back quad towards mat. Use the grip of the palms on the mat to "pull" your chest through your arms. Aim for 1-2min./side. Day 7 of #RunnersLoveYogaYINYANG is #camatkarasana/#wildthing incorporated into your vinyasa. The easiest way to get into this pose is to drop there from downdog (like I do here). You can always stay at the step right before this if you like too: in downdog, send one foot to the sky, bend that knee, let that foot drop towards the opposite side to open up that hip. Wherever you are, remember to breathe. P.S. Put sound on for calming rain! 2. From updog, tuck the toes under of your left foot to bring weight into this leg. Exhale, and simultaneously send your right foot high to the sky. Bend your right knee--this is the leg that's in the air--and let your foot start to drop down towards the left! Let gravity pull this foot all the way down to the left side until you land; this flips you over to wild thing! (This may feel scary if you're doing this for the first time but I promise it's super fun! 3. From whatever wild thing you chose (full land or just staying at the bent knee), now transition into some variation of side plank. Option: if you're doing full vasisthasana with the toe bind, you might try transitioning from here to lunge! Otherwise move from side plank back to regular plank, and inhale back to updog. 1. From updog, tuck the toes under of your right foot to bring weight into this leg. Exhale, and simultaneously send your left foot high to the sky. On your next breath, bring your left knee into your chest and plant that foot at the front of your mat. Exhale, press strongly into both feet to come up into lunge. 2. Lunge movement: bring hands into prayer, exhale and lower back knee but do not touch down. 🔹 Inhale, reach arms to the sky. 🔹Exhale, reach arms forward and sweep them back. 🔹Inhale arms back up to sky. 🔹 Exhale, smoothly bring hands to prayer and lower back knee (but not all the way). Repeat as much as you like! 3. Optional: take this to our other challenge poses. On the next time you exhale and reach your hands forward, release them to the ground and send left foot up to the sky. Bend at hip and knee; flip over to #wildthing. Transition to outer edge of right foot to come into side plank. If going for the toe grab, try then transitioning into low lunge or a split! Listen to your body and wherever you are, breathe! Day 9 of #RunnersLoveYogaYINYANG is a return to yin yoga with a restorative #baddhakonasana/#boundanglepose! This pose doesn't take very long to demo, so here is my attempt to simultaneously entertain you, show how yoga offers endless sequencing possibilities (I was in #dwipadasirsasana just before this), and to go from super yang to very yin yoga in 15 seconds. Once you get to this pose, you might not want to come out! Take your time here and enjoy it. 1. At seated, bring soles of feet together. Concentrate on especially pressing pinky-side edges together. 3. Grab your feet with your hands. Inhale tall through your spine; on your next exhale keep your spine tall as you lean forward. On your subsequent exhale, let your upper body round and relax into the pose. Find somewhere comfortable for your forehead to rest--this may mean anywhere from several cushions stacked up to just the ground. Rather than stretching to max capacity, find somewhere for your forehead that is comfortable. Close your eyes and relax your forehead. Breathe. If using a block or cushions for your forehead, you might try removing these or going to a lower level once you've been in the pose for a while. Stay for at least one minute. Day 10 of #RunnersLoveYogaYINYANG is #parivrttaanjaneyasana/#revolvedlunge incorporated into your vinyasa! Here I demo the following sequence: downdog➡️ (inhale) forward to plank ➡️ (exhale) lower, (inhale) updog ➡️ (exhale) downdog w/leg to sky, (next exhale) plant foot outside hand for revolved lunge ➡️ (on an exhale) flip over to wild thing ➡️ (exhale) flip back and lower through 3-limbed chaturanga ➡️ (inhale) updog ➡️ (exhale) downdog. Repeat other side. 2. Mindfully step foot in the air outside your front hand. 3. Now send the hand nearer to your foot to the sky; let your gaze follow. You might pause here and breathe--this is a good hip stretch too. Keep reaching through the back heel. 4. (If continuing on to wild thing) bring hand back down to lightly touch on mat--use this hand for support as you send your front foot to the sky, bend at hip and knee, and flip over for wild thing. In wild thing, reach through your fingers! Breathe here, then flip back over and lower through 3-limbed (or regular) chaturanga. Inhale to updog, exhale to downdog to come back to start. Day 11 of #RunnersLoveYogaYINYANG is #fallentriangle incorporated into your vinyasa using poses we've just practiced in the challenge. This sequence can be summarized: revolved lunge ➡️ fallen triangle ➡️ wild thing ➡️ chaturanga (lower through push up), inhale to updog, exhale to downdog with leg in the air; repeat sequence on other side. 1. From downdog with one leg in the air, mindfully step foot in the air outside your front hand. 2. Now send the hand nearer to your foot to the sky; let your gaze follow. 4. On an exhale, float the reaching hand back to the mat. You can pause here and lower your hip for a good IT band stretch. You can also try picking up your outstretched leg! 5. Pull the knee of your outstretched leg back into your chest. Send this foot to the sky and bend at hip and knee to flip to wild thing. Then flip back on over and lower. Inhale to updog, exhale to downdog with leg in sky and begin again. Day 12 of #RunnersLoveYogaYINYANG is #ekapadarajakapotasana/#pigeonpose with a forward fold--forehead rests on the floor. 1. From updog, tuck the toes under of your left foot to bring weight into this leg. Exhale; send your right foot high to the sky. 2. Inhale to mindfully bring your right knee outside your right foot; plant this foot outside your hand.🔹Release left foot toes to your mat. 🔹 Pause, breathe here. Gently press your right arm into leg, leg into arm. 3. Stay at palms OR (only if this is working for you--do NOT worry if it is not) drop to forearms. Again pause and breathe here. ⭐️ Another modification: drop your right forearm onto a yoga block or cushion. 4. Move your right palm/forearm/block out of the way and "heel-toe" your front foot across the front of your mat. The more parallel your shin is to the front of the mat, the deeper the stretch. Adjust this to your body's needs--you can angle your knee more forward to make a triangle shape with your leg instead of keeping the shin parallel. Keep front foot a little flexed. 5. Send right hip forward and left hip back, as though lining up hips with a magnet. Press front of back quad towards mat. Use the grip of the palms on the mat to "pull" your chest through your arms. Pause for a few breaths here, then walk hands out onto the mat to release upper body towards floor. Rest forehead on the floor (or a block). Stay for :45-1:00 each side. Repeat for a total of twice per side. Day 13 of #RunnersLoveYogaYINYANG is #upavisthakonasana/#wideleggedseatedforwardbend! We're back to yin for our last few days! Try some of our yang flows and follow up with 1-3 of your favorite yin ones so far. 1. Use baddha konasana / #boundanglepose with the forward fold as a warmup here. 2. Carefully pick up one knee from underneath and stretch out your leg; repeat other side. Then press your palms behind you to lift your bum up and set it back down--this helps even out how you're sitting on yor hips. Keep feet a little flexed here. 3. Inhale tall and then walk your hands out until you come to your forearms. Relax your legs here and stay 1-3 minutes--listen to your body. Optional: walk hands all the way out--only go here after pausing for a period of time at your forearms. 4. To come out of pose, carefully pick up one knee from INSIDE edge (safer for your knees)--my gymnast mom taught me this! Enjoy, and have a great Saturday. 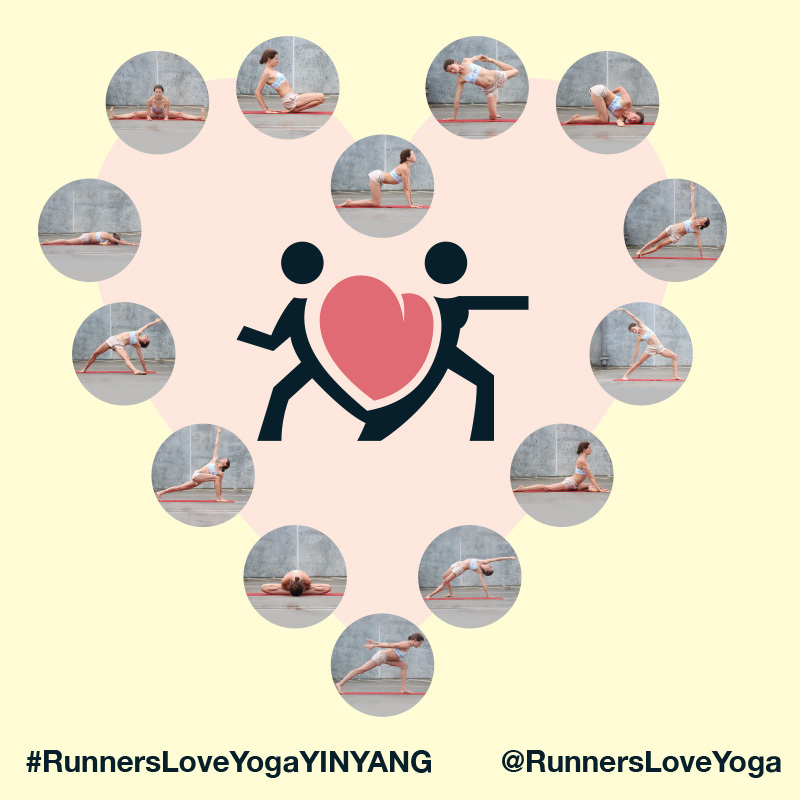 Day 14 of #RunnersLoveYogaYINYANG is a yin yoga #anklestretch. There's no official Sanskrit for this leaning back version, though the fully seated pose is #vajrasana. This is our LAST DAY of the challenge! Since we're working on balancing our typically yang yoga with more yin, try a few of our active flows and then choose 1-4 total yin poses including this pose to conclude your practice. Winners announced last day of June to give anyone time to catch up. 1. #ustrasana/#camelpose is a great prep for this ankle stretch because in both poses you have to resist the urge to lean backwards. In camel, keep pressing your hips forward (grabbing the heels is bonus--you can always keep palms on the lower back). In the ankle stretch, keep your back arched to press your chest forward. Of course, ustrasana is just one option for what might precede the ankle stretch. 2. Come to seated on your heels with legs together and toenail-side of feet on the mat. 3. Begin with palms behind you for support. Press into palms to pick up knees. Gently lean back but maintain the arch in your back. Stay here OR if comfortable, bring hands just above knees. Stay here OR bring hands into prayer. If trying this pose for the first time, you may want to stay on palms since this will likely be comfortable for longer. Stay for up to one minute.